Looks fab Emma. I soooo want a blow torch- ok that just sounds rude!!!! And I must agree, you do have some serious opinions abt creme brulee! I have a question for you though, whenever I make any, they always have a slightly scrambled layer just on the very top. DO you know why this might be? girlleastlikely -Do you mean that during baking in the oven you get a crust? That's normal. Or when you're torching? Perhaps if then make sure they're well chilled. Mine sometimes sort of melt very slightly underneath the caramel - you can see in the smashed in photo that some thinner creamy stuff has escaped. 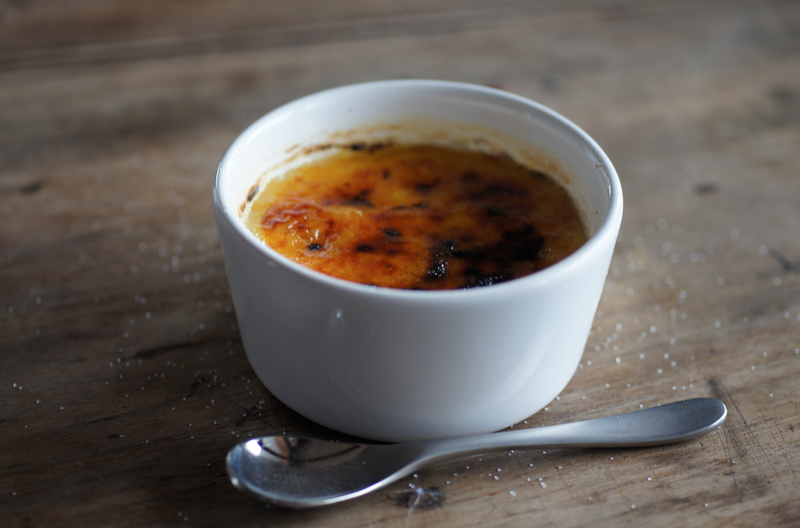 Creme brulee is one of my all time favourite desserts. I very rarely make it at home because I can't control myself and will eat the lot myself! Yours look lovely. My husband almost set the kitchen on fire the other day... he filled it with gas, over the sink to catch any spillage. Then ignited it to test it out, and pointed it at the sink, where the spilt gas had fallen. I've never seen flames quite like it. Luckily it burnt out quite quickly before anything got damaged (apart from the hairs on his arm) but it was pretty scary at the time! Aveen - wow, that does sound scary! I hate refilling mine, it's definitely the worst part of using one. girlleastlikely - yep! I thought so too the first time I made them. Apparently it helps in forming a good caramel top. When I made my wild strawberry ones (link up there) I carefully scraped it off but I reckon for normal brulee it's good. Shouldn't be too thick or dark though. 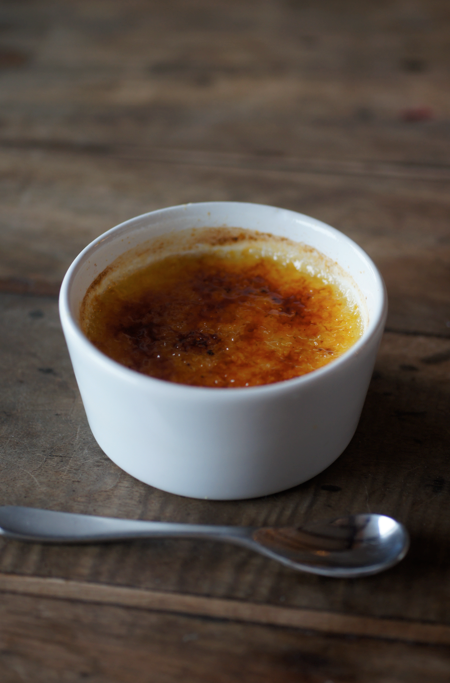 Creme Brulee has got to be one of my all time fave desserts too but I've never dared try to make it myself. I'm book marking the recipe though as you have inspired me to give it a try. 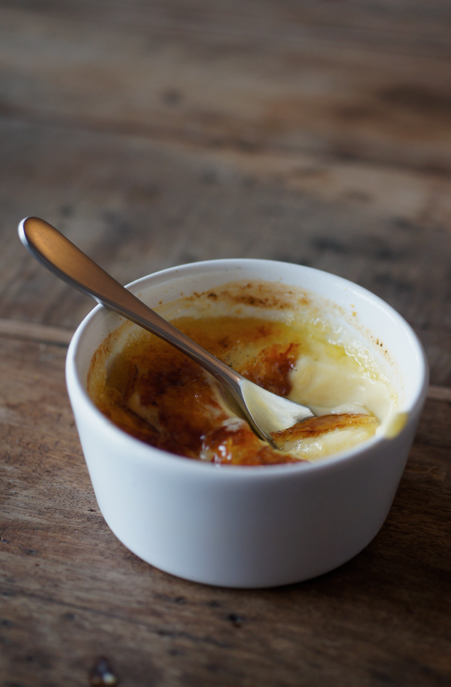 Oh yum, I love creme brulee, so creamy and delicious with that gorgeous sugar crunch you get on top! What a classic :) mhhh...! Beautiful crème brûlée and great photographs! 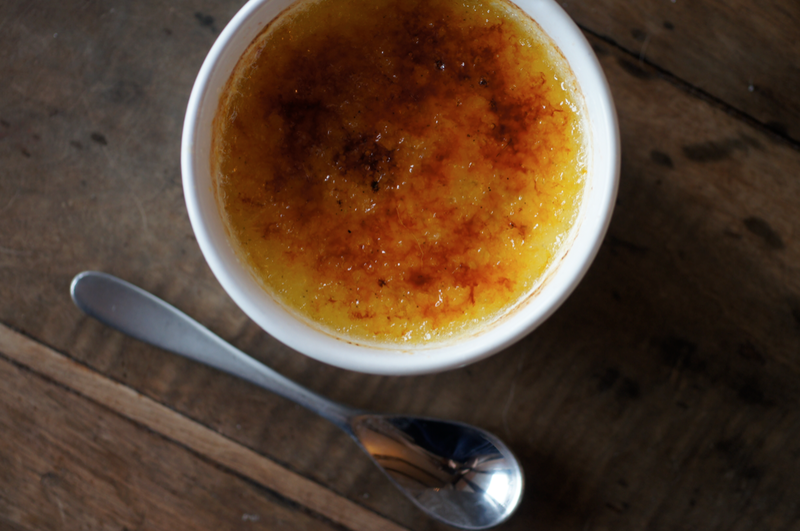 I am with you.... Creme Brulee is one of my favorite things to eat! I have never made it myself and am so happy to have your tried and true recipe. Have you ever tried it with cardamom? I had cardamom creme brulee at a wonderful restaurant years ago and have never forgotten how delicious it was. I haven't even had coffee yet, and now I want creme brulee! It looks amazing, and your description and opinion sounds remarkably like my own. I think I might have a look around for my torch over the school break--it's been far too long. 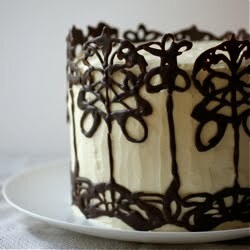 Divine goodness at the bottom, vanilla beans... I can almost taste it, I'm salivating. Love the shabby chic rustic back drop. This looks magnificent. I'm so excited to now follow your beautiful recipes.. I can never get my brule to brown nicely under the grill, but I'm too scared to use a blowtorch! WizzyTheStick - Hehe, I hope you get one! They're great fun. Cinabar - Don't be scared! The heat is so focused and your hands etc aren't close to the flame. Promise they're not awful. It goes without saying that I love a custard recipe. Must go and get a blow torch v soon. I also dislike the trend of creme brulee getting more and more solid in restaurants. It should be soft, creamy and have the memory of a wobble about it so it's a great contrast of texture through the caramel. That's it - just convinced myself to get a blow torch Today! Sally - I totally agree, a slight wobble is essential. Enjoy your blow torch! 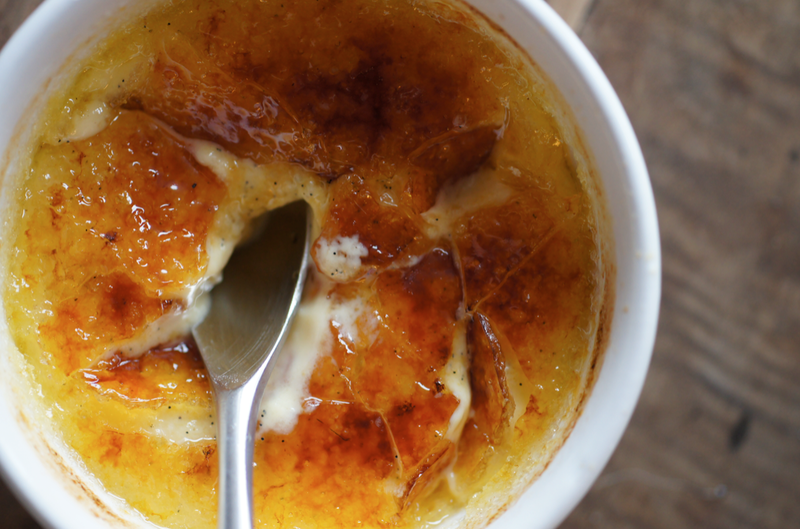 I wouldn't say that creme brulee is one of my favorite desserts. I too have often been dissapointed when I've ordered them from restaurants. I've tried about five different recipes and while they've all been enjoyable they've all been either too rich, too thick or to thin a consistency. I was really impressed by the amount of vanilla seeds I saw in your pictures and the method you've used is a little different to the ones I've previously tested so I'm going to give yours a go and see if it can change my mind. Thanks for sharing! I finally got the chance to try the recipe. I followed the instructions and ingredients as required, but the result I got was horrible! 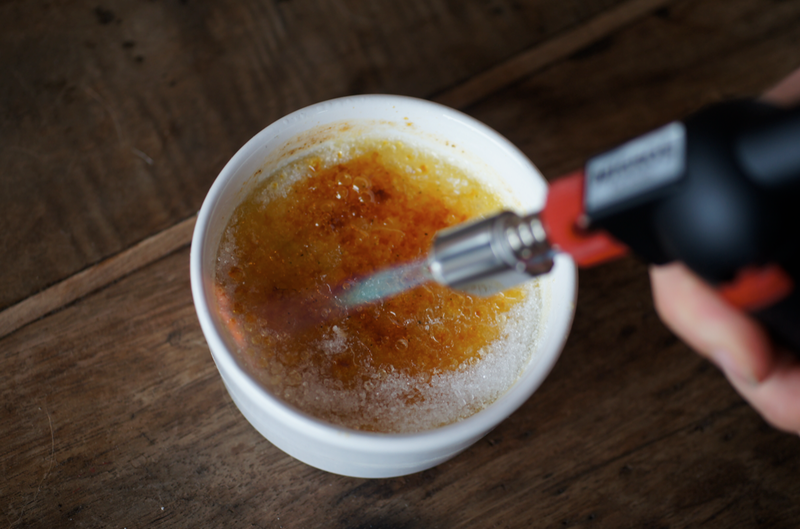 The brulee was curdled and watery and the crust was thick and made caramelizing the sugar very difficult. 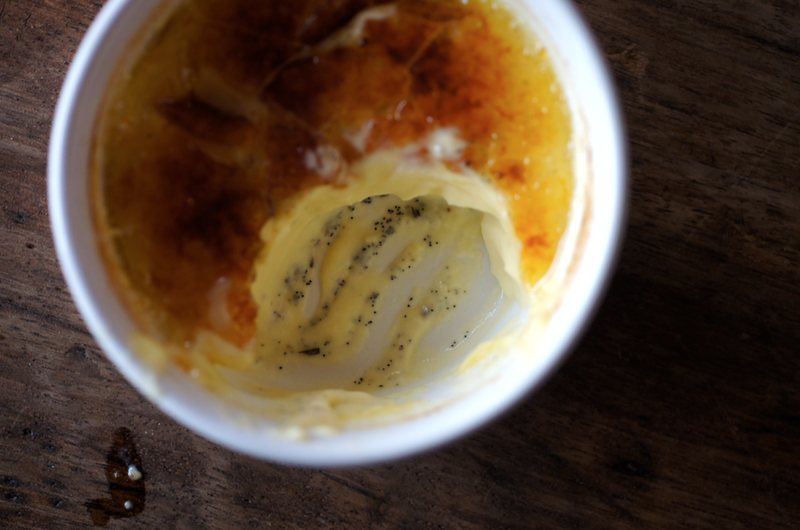 I'm not sure what went wrong but all I can say is the use of double cream in creme brulees has never worked out for me. I already have another recipe which uses 1/2 milk and 1/2 pouring/pure cream, which works every time and isn't too rich. One thing you might want to add is skimming any additional froth off the top of the mixture before distributing it into the ramekins to prevent such a thick crust from forming. I'm really sorry to hear that it didn't work for you. As I said, I've always had flawless results. Emma, My fiance is allergic to egg. 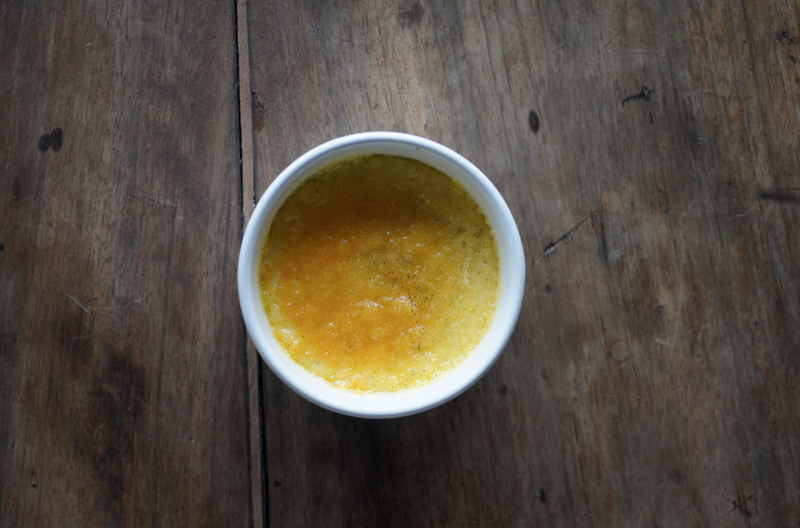 Do you have any eggless custard recipe? I'm afraid I don't know much about egg substitution - especially in something like this where it's such a key ingredient. Perhaps try asking someone who specialises is vegan or egg free cooking or baking? Sorry I'm not more help. Hi Emma. I made this yesterday and wanted to thank you for recipe. It is really easy, especially given that you don't need to pre-cook the custard and just whizz everything up instead and pop it in the oven. The result was great. It was a little lighter than a traditional creme brulee, and actually after a meal this is not a bad thing. We will try a more traditional method involving cooking the custard to compare. The only let down was the topping, and it has nothing to do with your recipe! I think we need some practice with our blowtorch! It was its first outing and we ended up with a few burnt bits! Still a delicious dessert though!